The wax rolled candles is made by hand and keeps the heat of the hands that made it. 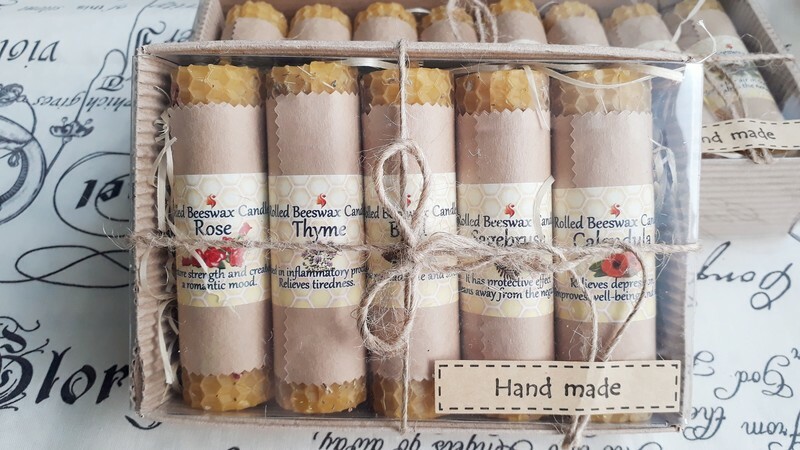 The wax is made from natural beeswax, without adding paraffin! Wax is a biologically active product with extensive pharmaceutical and medicinal properties, and in tandem with dry herbs, they form a strong alliance in the fight against ailments and the improvement of the general condition of the body. Candles are not aromatic, they don’t have aroma oils. When they are burning, dry herbs can crackle a little. The aroma of herbs and honey will be light. Burning time is about 1 hours. Keep in a warm and dry place. IMPORTANT! The candle must be freed from the entire wrapper and fixed in a deep candlestick. Do not leave a burning candle unattended.